It is now officially autumn here. Many years ago (so long ago I can start the sentence with ‘once upon a time’) when I was a child I tasted my first spice cake. This was on Halloween when the local bakery was giving out pieces of cake to Trick or Treaters. This particular bakery was owned by a man from the Netherlands who was a wonderful old world baker. The cake was light and delicious and I have loved spice cake ever since my first bite. I wish I had his recipe, but I do not, so I converted a traditional wheat recipe to gluten free. I was not in the cream cheese frosting mood and wanted a frosting that was fluffier with an interesting flavoring to go well with spice cake. The cake is moist and light with a harmonious blend of spices where one spice does not over power any other. This recipe is quite forgiving. I made a few errors adding the ingredients at the wrong times and in the wrong way when mixing the batter and it still came out great with dome shaped tops. I was so happy with how the cupcakes turned out. 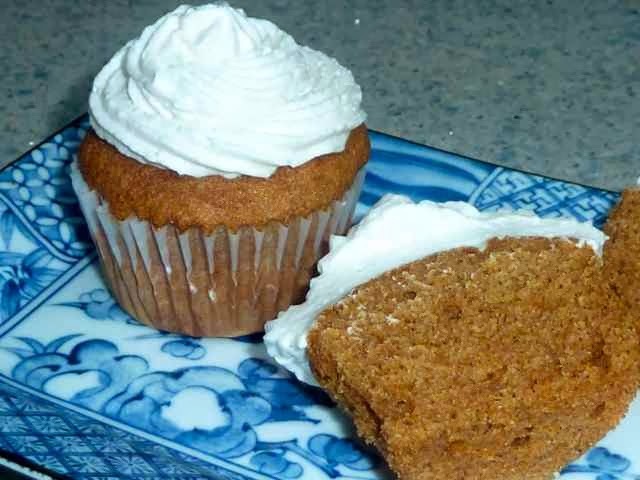 The Spice Cupcakes are absolutely delicious and the orange frosting goes perfectly with the spices. Recipe can be doubled with good results. 1/2 cup Milk - For Dairy Free use non dairy milk such as almond, rice, etc. Preheat oven to 350 degrees. Prepare muffin tins by putting a paper cupcake liner in each hole. 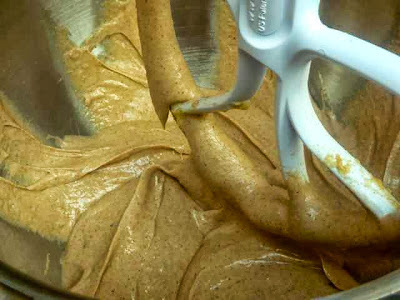 In a large bowl add all the flours, xanthan gum, salt, baking powder, baking soda, brown sugar and spices. Mix together well. In a separate bowl mix the eggs, milk, vanilla and melted butter or oil. Mix well. Add the wet ingredients to the dry ingredients and mix together with an electric mixer until smooth and well blended. 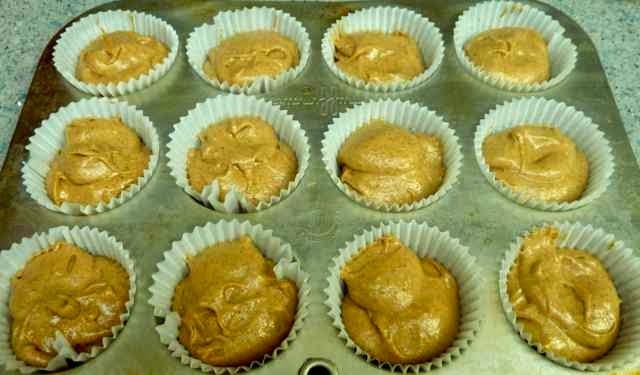 Divide the batter evenly among the 12 liners in the muffin tin. Batter divided evenly and scooped into 12 liners. Bake 20-30 minutes or until a cake tester comes out clean. Baking time will vary according to your oven. Frost the cupcakes, if desired, and enjoy fresh. The cupcakes will last at room temperature for 3 days. If you freeze the fresh cupcakes you can enjoy them later by thawing them for half an hour before eating them. 2 Tbs. Milk - For Dairy Free use dairy free milk such as Almond, etc. Frost the cupcakes. 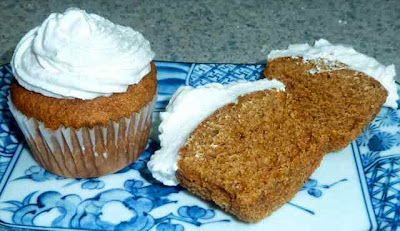 You can use a knife to spread the frosting. You can also fill a pastry bag, fitted with the tip of your choice, with the frosting and decorate each cupcake. 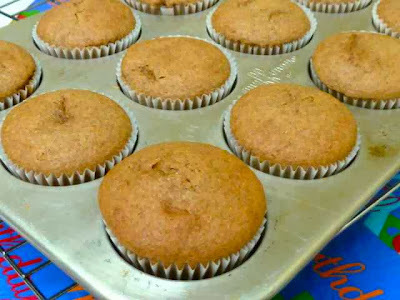 GLUTEN FREE SPICE CUPCAKES Makes 12 cupcakes Recipe can be doubled with good results. Ingredients CAKE 3/4 cup Sorghum Flour 1/4 cup Chickpea Flour 1/4 cup Tapioca Starch 1/2 tsp. Xanthan Gum 1 1/2 tsp. Baking Powder 1/2 tsp. Baking Soda 1/2 tsp. Sea Salt 1 tsp. Ground Ginger 1/2 tsp. Ground Cinnamon 1/4 tsp. Ground Nutmeg 1/4 tsp. Ground Allspice 1/4 tsp. Ground Cloves 3/4 cup Brown Sugar (I used organic) 1/2 cup Milk - For Dairy Free use non dairy milk such as almond, rice, etc. 2 large Eggs 1 tsp. Vanilla Extract 1/2 cup Butter-melted; For Dairy Free use Oil such as Olive or Canola Directions Preheat oven to 350 degrees. Prepare muffin tins by putting a paper cupcake liner in each hole. In a large bowl add all the flours, xanthan gum, salt, baking powder, baking soda, brown sugar and spices. Mix together well. In a separate bowl mix the eggs, milk, vanilla and melted butter or oil. Mix well. Add the wet ingredients to the dry ingredients and mix together with an electric mixer until smooth and well blended. Divide the batter evenly among the 12 liners in the muffin tin. Bake 20-30 minutes or until a cake tester comes out clean. Baking time will vary according to your oven. Frost the cupcakes, if desired, and enjoy fresh. The cupcakes will last at room temperature for 3 days. If you freeze the fresh cupcakes you can enjoy them later by thawing them for half an hour before eating them. Ingredients FROSTING 1 cup Shortening (non hydrogenated such as Spectrum) 2 cups Confectioner’s Sugar (I did not sift it and it weighed 14 ounces) 1 tsp. Vanilla Extract 1 tsp. Orange Extract (I used natural flavor from Bakto Flavors, LLC) 2 tsp. Milk - For Dairy Free use dairy free milk such as Almond, etc. Directions Add all the ingredients to a deep bowl. Mix with an electric mixer until well blended, smooth and fluffy. Frost the cupcakes. You can use a knife to spread the frosting. You can also fill a pastry bag, fitted with the tip of your choice, with the frosting and decorate each cupcake.